As a result of this mini invasion, I am on the hunt for fun things that we can do together, and it’s a bonus if they are free-cheap and have application for class. Today I bring you one of those activities: a paper cutout mini city. Most of us do some form of an “around town” unit, and make maps too. This has the potential to change that activity up a little in making it 3D. I love that one of the cities is Paris and is already labelled in French. What fun! At home, I think we’ll color them and build a city together… and then it will only be a matter of time until the hot wheels cars make an appearance Seeing as how all but the youngest are boys, it would not surprise me if Godzilla makes an appearance and the city gets attacked shortly afterward, but I’m certainly not going to discourage their creative play time! And now off to another reason I love summer: The World Cup! I’m torn–I love both Spain and Chile and they are playing each other. Win-Win? I think so! Back in the mid-90’s, before I knew about things like “comprehensible input”, “authentic resources”, or really, much about language acquisition, I still had a sense that the textbook way of language learning wasn’t really working for me and my students. This lingering, nagging feeling was the impetus for what has become an unending quest to hone this craft of language learning and teaching. I just completed year 21 of teaching, and I continue to grow as a learner and a teacher nearly every day… and I’m not done yet. In the late 1990’s, I had the opportunity to go to a workshop by Pam Kaatz that dealt with something that she called “Building Artificial Realities”. Though I didn’t know it at the time, this workshop would introduce me to teaching with comprehensible input and a teaching style that promoted acquisition. I still teach a version of the lesson over 15 years later, though it also has 15 years’ worth of refinements. I was working on it again last week and solicited some help from my Twitter PLN to expand it even more. In today’s post, I’ll attempt to explain this unit of study that has been so successful for me. Clearly, this is a unit that takes a while! To begin, I take my laminated flags for each of the countries and we practice pronouncing their names in Spanish. Though it might seem odd to use these countries as opposed to all Spanish-speaking countries, they are strategically chosen to introduce students to the sounds of Spanish: ñ in España, j in Japón (and accents too! ), rr in Inglaterra, x in México, g in Argentina, and all the vowels too. We can build their language ears with sounds of Frahhhnciahhhh and Roooooosia instead of the short a’s and u’s that we use in American English. As we go through the countries, we also talk about the flags: what colors, what designs, quantities, and even which direction they go, all through modeling and spiraling questions. We start with yes/no questions (“Is there white on this flag?”), followed by either/or questions (“Is this red or white on the flag?”), and then progressing into more complex questions that finally result in sentence-length answers. Our next step is to adopt temporary new identities by country groups. I hang the large laminated flags around the room, and give students small flag cards like the ones above to assign them a new home country. Each country group will have 3-4 students in it. Once there, I model how to say “I am from…” and complete it with the country of the new groups. So I say “Yo soy de los Estados Unidos…¿de dónde eres tú?” And we move slowly through the groups calling on people semi-randomly, ensuring that everyone understands AND gets a chance to answer. Once we have a good handle on where we are from, I add in the languages by modeling the names of the languages and then saying “Yo soy de los Estados Unidos y yo hablo inglés y español. ¿Cuáles lenguas hablas tú?” and we repeat the process. Over the first few weeks we continue to spiral through the concepts, reviewing as needed, until we have worked through the topics outlined above. The process is generally the same: picture supported modeling, followed by question and answers that spiral from yes/no up through complete sentences, and eventually to comparison and contrast. They learn to say that they live in the capital city, they eat a typical food, visit a famous landmark, use their currency, have a passport, speak their language, what nationality they are (complete with adjective agreement), and play a particular sport. In the course of the questioning, they also get a good foundation in several question words: Where do you live? What do you eat? Which do you prefer? Who lives in Paris? 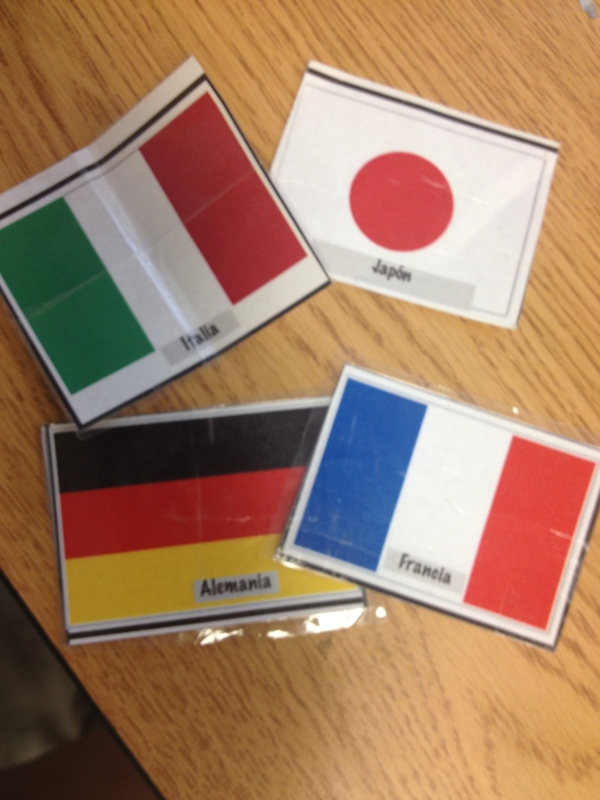 Students “adopt” a variety of countries over the unit, so they are exposed to a variety of countries; for some students, this is new material in any language. They pick up conjugation and sentence syntax through intense “real” practice. Though we start with I/you question and answers, we quickly expand into 3rd person scenarios (he is from Spain, but they are from France) and then also wrap around to we v. they to round out the conjugations. By the time we are done, students have a sense of enough content that we can use it as an anchor all year long. We continue to return to these concepts over and over. When we start working on new verbs, it’s a quick, but effective review to remind them of the patterns they learned in their country groups, and it sticks with them. The tentacles of this lesson wind their way through most of the lessons that we do in one form or another. As a side benefit I also find that these country names, places, and content come up over and over in the non-textbook resources that we use, and this lesson pays off then too. When we talk about vacationing in España, Alemania usually pops up again thanks to Spain’s popularity as a vacation spot. All told, El Mundo es un Pañuelo unit takes us about 2-3 weeks to do well, but we usually do other things along with it to keep it fresh and to allow the content to sink in. This fall I think I’ll pair it with some World Cup activities and music to kick things off with a bang! But then who knows? As I continue to read, explore, and grow this summer, the plan may well change by then, but all for the better. Will you join me on the adventure? Have you seen El Internado? Thanks to Kristy Placido, I started watching this show with my intermediate class this semester, and was absolutely blown away by their response. They would do ANYTHING to watch the show–including homework! I started having to give them a schedule of our weekly lesson plans just so they weren’t continually asking me when we would watch it! One student told me, “on days that I wanted to skip your class I came because I knew we’d be watching Internado”. They asked every guest speaker if they had seen it, and it has come back to me from other students and teachers that they are passionately talking about it outside of class. Perhaps the icing on the cake was that they opted out of going to weekly study hall to stay and watch part of another episode on their own. I’m also watching the rest of the seasons this summer, and my family is even hooked on it–and they don’t speak Spanish yet! My son has even confessed that he looked up the show online and is sad that he knows some of what’s going to happen in future episodes. The show is PG-13 ish, so depending on your school climate, you might want to send a consent/permission letter to parents before beginning. My students and I had a very direct conversation about some of the language in the show–that some of it would not be appropriate in class, but is accurate for the setting of the story. I used the dialogue and scenarios to teach some pretty challenging grammar structures, as well as vocabulary. We worked on subjunctive by talking about what Marcos and Paula would want their parents to do. We learned several idioms, especially dealing with romance and frustration. One of my favorite parts, though, has been the doors it has opened to talk about culture and history. For example, in order to understand one of the first season episodes, you have to know about Ratoncito Pérez; in another, it’s helpful to know about the Spanish Civil War. We read TPRS Publishing’s La Hija del Sastre as part of our curriculum, so students had a familiarity with that period of time; I prepared a mini-unit to help them with Ratoncito Pérez here. We also followed some of the action on Twitter as the show was being shown in Chile this spring. I’ll teach the beginning of the intermediate course in the fall, followed by the second part in the spring. My plan is to start the show in the fall with the goal of completing season 1, then continue through season 2 and maybe 3 in the spring. To that end, I’ll be working on a lot of support materials and activities this summer to supplement the ones I’ve already created, and would love your input! I’ve added El Internado pages to the Langcamp Wiki so that we can work collaboratively. Please sign up to be a part of the creative process at the Wiki page, and/or leave ideas in the comments below. Have you watched El Internado? What are your thoughts about it?